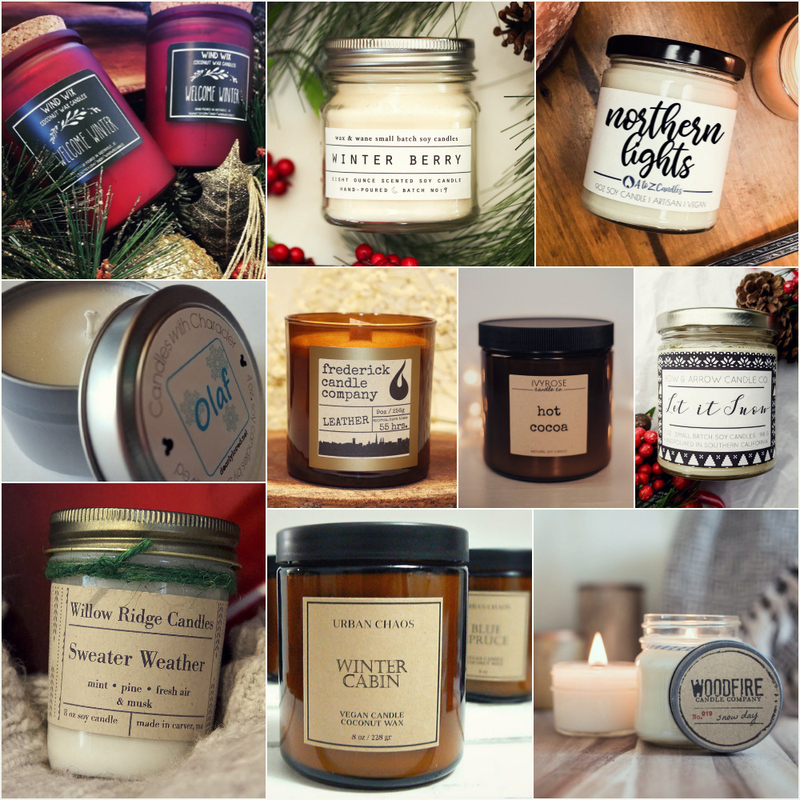 Now that winter is pretty much here, it’s time to fill your house with lots of glorious seasonal scented candles. Sweet, spicy, woody or green – whatever your favourite cold-weather scent, you’re sure to find it in our round up of candles that are perfect for winter. Welcome Winter By Wind Wix Candles – Welcome Winter candle in a gorgeous burgundy jar with a cork lid. This scent has top notes of snow covered balsam, eucalyptus leaves and Cedarwood. Winter Berry By Wax & Wane Candles – One of the only three fruits native to North America, cranberries grow along sandy bogs and marshes across the Northeast. This scent is delightful twist on traditional winter and holiday candles combining the tart but sweet scent of berries with notes of earthy evergreen notes. This candle has a high essential oil content and is infused with fir and patchouli essential oils. Northern Lights By A To Z Candles – Imagine cold winter nights, enjoying the Northern Lights flash across the sky. Crisp greens and herbal notes become intertwined with the outdoor scent of spruce, forest pine, oak moss, and cedar wood. Olaf By My Dearly Loved – This candle will make you feel like you’re in a crisp, winter wonderland with Olaf, himself! The scent of this soy wax candle is a combination of rich chocolate and peppermint. Leather By Frederick Candle Co. – A warm, musky fragrance that evokes the luxury of sweet fine leather – a subtle blend of earthiness and elegance. Hot Cocoa By Ivy Rose Candle Co. – Rich, sweet scent of everybody’s favorite…chocolate! Let It Snow By Bow & Arrow Candle Co. – Sweet peppermint blended with buttery, warm vanilla. Sweater Weather By Willow Ridge Candles – A burst of fresh air tingles with mint as it opens this festive blend, Snow covered pine needles are sweetened with winter berries and laced with wood notes that lead to the velvet mossy undertone. Lingering sweetness of vanilla musk finishes the scent. Winter Cabin By Urban Chaos – Winter Cabin is a fabulous infusion of smoked Tobacco, Pine, Wood & Patchouli, finished with light notes of vanilla deliciousness. A strong and unique scent, this candle reminds me of a cabin getaway in winter. Created with essential oils and fine fragrance, the natural wood wick further warms up any room. Snow Day By Woodfire Candle Co. – What was better as a kid than a snow day? Nothing. This candle brings in all the familiar scents and feelings of the best day of the year…fresh snow, festive lights, and cozy winter spices. Cinnamon, clove, vanilla musk and mulberry. Hints of cassia root, eucalyptus, amber, fir balsam, pine, and cedar. What’s your favourite winter scent? Let us know in a comment below. Stay tuned for more product features and reviews, and be sure to follow us on Instagram.